It’s not quite human cloning, but it’s close. Researchers reported using a variation of somatic cell nuclear transfer (SCNT) — the same technique that created Dolly the sheep, the first mammal to be cloned, from a skin cell of a ewe — on human cells. SCNT involves replacing the genetic material of an egg cell with the DNA from a mature cell (a skin cell, for example). 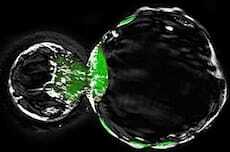 The egg is then stimulated to divide, and if it develops fully, produces a genetically identical clone of the animal from which the mature cell was taken.